Canvas Wall Art Gallery Wrap Canvas Prints - Keep Calm and Carry On | Stretched Red Canvas Home Decor Ready to Hang - 12" x 18"
Fast shipping and looks great on my wall! Excellent quality! A little piece of nostalgia. Perfect for my Man-Cave. I matched this canvas print with a wonderful, London themed shower curtain, that I also got from Amazon. I was thrilled with the quality and price of this Canvas Wall Art. I was afraid the brighter red option would be too "orangey." I chose it in the darker red and I am glad I did. I am really impressed with the quality of this product. This print looks beautiful and flawless. The size is decent so that it really sticks out when you hang this in your room. The frame is sturdy and easy to hang . Finally, the packing was secure and shipping is fast. I really cannot find anything to complain about this product. Love it. Thank you. I have always liked the "Keep Calm and Carry on" saying. A good reminder when life gets tough. I didn't read the dimensions, so when this showed up I have to say I was surprised at how large it is! Perfect for a hallway, a center piece to a room or anything really. It has so much potential. The canvas is stretched nicely, it has a wooden frame and there is even a piece across the middle to keep it from collapsing. The canvas is sort of an off teal/grey color. The lettering is rather crisp, no flaws and it seems to be rather sturdy. 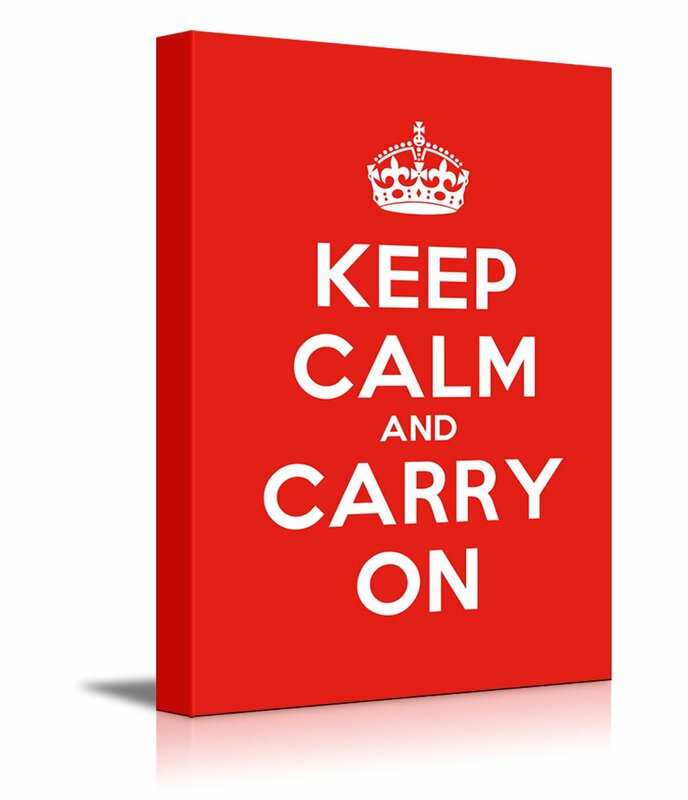 Over all this is a lovely piece to hang up in your home, it's a great way to keep reminding yourself to, well.... "Keep Calm and Carry On"